The thrilling encounter between India and Afghanistan, Super four match ended up with a tie. The Indian fans had their hearts in their mouths during the last over where they needed 7 runs off 6 balls. Ravindra Jadeja brought some respite by hitting a boundary, but then got out on the last ball when India needed just one run to win the game. The result of the match, broke hearts of many fans in the stadium. This included a cute kid who was seen crying after the match. The camera showed his crying visuals on the big screen and the kid looked completely inconsolable. AFG Pull Off Last Over Tie Against IND. A few on-lookers tried to cheer him, but his crying continued. 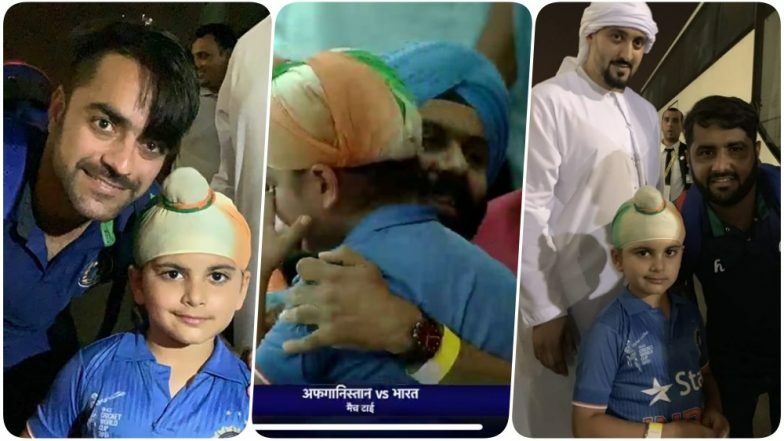 Then came Afghanistan’s Rashid Khan and Mohammad Shahzad who not only met the kid but also consoled him. Much to everyone’s surprise the kid stop crying and was smiled. The Afghani cricketers even posed for a picture with him. The snaps went viral online. Talking about the match, Mohammad Shahzad set fireworks with his batting and scored 124 runs off 116. The innings came with 11 fours and seven sixes. Mohammad Nabi made 64 runs off 56 deliveries and put up 252 runs on the board. In reply, KL Rahul scored 60 runs off 66 balls and Ambati Rayudu made 57 runs from 49 deliveries. Dinesh Karthik made 44 runs off 66 balls.